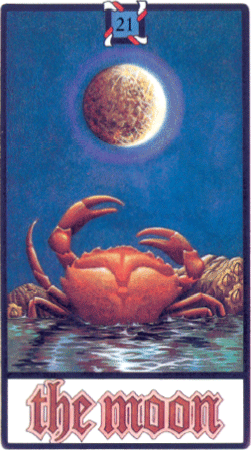 The Moon Card tells us to be swayed by what emerges from your unconscious and remember there is a feminine logic as well as a male logic. Intuition means applying an alternative route to a problem. The sun's rays go direct, straight, obvious, on the surface. The moon from her depths finds a better way that reflects the sensitivities of the people involved, because most problems focus on people.